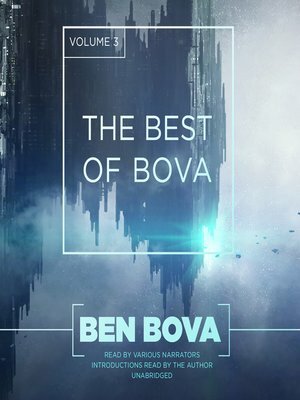 The third and final volume of the very best of Ben Bova, creator of the New York Times bestselling Grand Tour science fiction series, six-time Hugo award winner, and past president of the National Space Society-a grand master of science fiction storytelling. These stories span the five decades of Bova's incandescent career. Here are tales of star-faring adventure, peril, and drama. Here are journeys into the mind-bending landscapes of virtual worlds and alternate realities. Here you'll also find stories of humanity's astounding future on Earth, on Mars, and in the Solar System beyond-stories that always get the science right. And Bova's gathering of deeply realized, totally human characters are the heroic, brave, tricky, sometimes dastardly engineers, astronauts, corporate magnates, politicians, and scientists who will make these futures possible-and those who often find that the problems of tomorrow are always linked to human values, and human failings, that are as timeless as the stars.